This data set reports the station-level daily weather observation data and the corresponding Daymet model predicted data for three Daymet model parameters: minimum temperature (tmin), maximum temperature (tmax), and daily total precipitation (prcp). Each data file contains the daily observations and Daymet model predicted values for one variable and one year (1980 - the current full calendar year) for stations across North America. Also included are corresponding station metadata files for each variable and year, including the station name, station identification, latitude, and longitude. These data are provided to facilitate station-level cross validation analyses that can offer insights into the regional accuracy of the Daymet model for the three station-level input parameters. Regression statistics and mean absolute error can be derived using the provided companion file R code to assess temporal and spatial patterns of uncertainty. There are 117 netCDF version 4 files that contain the daily input observations and predicted values. Each variable-year combination is a separate file. Provided as companion files, are 117 corresponding comma separated value (.csv) files that contain metadata for every surface weather station for the variable-year combinations. Also, provided as companion files are a sample R code and sample output files (7 files total). Figure 1. Station-level cross validation sample output from the included R script companion file. 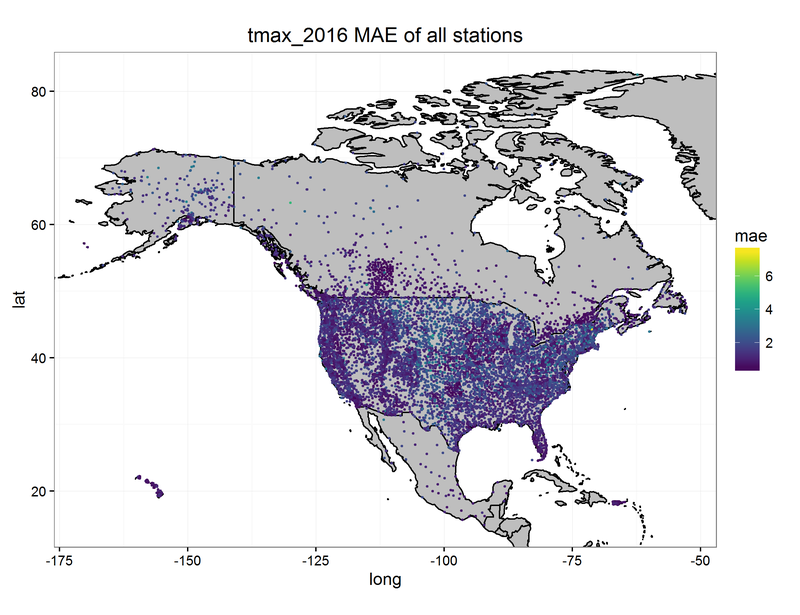 Weather station locations and annual mean absolute error (MAE; degrees C) for the variable maximum temperature (tmax) in 2016. Derived from file daymet_v3_stnsxval_tmax_2016.nc4. These data are provided to facilitate station-level cross validation analyses that can offer insights into the regional accuracy of the Daymet model performance for the three station-level input parameters. Regression statistics and mean absolute error can be derived using the provided companion file R code to assess temporal and spatial patterns of uncertainty. The surface weather observations included here are the same input used for processing "Daymet: Daily Surface Weather Data on a 1-km Grid for North America, Version 3" (Thornton et al., 2017), and were obtained from the Global Historical Climatology Network - Daily land surface station observations data set acquired from the National Environmental Satellite, Data, and Information Service (NESDIS) (Menne, 2012). Daymet is a collection of gridded estimates of daily weather parameters generated by interpolation and extrapolation from daily meteorological observations. Weather parameters in Daymet include daily surfaces of minimum and maximum temperature, precipitation, humidity, radiation, snow water equivalent, and day length produced on a 1 km x 1 km gridded surface over North America, Puerto Rico, and Hawaii. Spatial Coverage: North America and Hawaii: including Canada, Mexico, the United States of America, Puerto Rico, and Bermuda. There are 117 netCDF version 4 files that contain the daily input observations and Daymet model predicted values. Each variable-year combination is a separate file. Provided as companion files are the corresponding 117 comma separated value (.csv) files that contain metadata information for every surface weather station. These files are also available as separate variable-year combinations. Also, provided as a companion file is a sample R script that takes as input the variable and year of interest and (1) derives R-squared and mean absolute error (MAE) values of the observed vs. predicted values for each station, (2) plots and maps input and derived data, and (3) outputs a *.csv file containing the station_IDs, latitude and longitude, R-squared and MAE values of the observed vs. predicted for each station for the specified variable-year combination. There are 117 netCDF files, where each variable-year combination is a separate CF-compliant netCDF-4 format file. These station-level files contain daily data from Daymet input surface weather stations as separate files for each of the three input variables for each year of available data. Note that there may be a different number of stations from year to year and between the three variables. The ground weather station identification (as a string value) as extracted from the GHCN-Daily input files. The ground weather station name (as a string value) as extracted from the GHCN-Daily input files. The station elevation reported in the metadata readme as extracted from the GHCN-Daily input files. The day number since the beginning of the data set. Data are in a daily time step. The start and end day number since the beginning of the data set (1980-01-01). A station index location within the netCDF file. The station longitude reported in the metadata readme as extracted from the GHCN-Daily input files. The station latitude reported in the metadata readme as extracted from the GHCN-Daily input files. Station observed daily total precipitation in centimeters per day, sum of all forms converted to water-equivalent. Precipitation occurrence on any given day may be ascertained. Data are in a daily time step. Daymet model predicted daily total precipitation in centimeters per day, sum of all forms converted to water-equivalent. Precipitation predicted occurrence on any given day may be ascertained. Data are in a daily time step. Station observed daily maximum (or minimum respective of file) 2-meter air temperature in degrees Celsius. Data are in a daily time step. Daymet model predicted daily maximum (or minimum respective of file) 2-meter air temperature in degrees Celsius. Data are in a daily time step. The data are stored and distributed as an individual CF-Compliant netCDF file for each year and variable. The most current Daymet data are being delivered to the user in both Daymet software and Daymet data versions. Version information is recorded in the header file of each of the CF-netCDF files within the Global Attribute fields; Version_software and Version_data. All Daymet data are provisional and subject to revision. There are 117 comma separated value (.csv) files that contain metadata information for every surface weather station included in the corresponding netCDF files for each variable and year data file. Each file represents a separate variable-year combination. Station Identification stn_id The ground weather station identification (as a string value) as extracted from the GHCN-Daily input files. Station Name stn_name The ground weather station name (as a string value) as extracted from the GHCN-Daily input files. Station Longitude stn_lat decimal degrees The station latitude reported in the metadata readme as extracted from the GHCN-Daily input files. Station Latitude snt_lon decimal degrees The station longitude reported in the metadata readme as extracted from the GHCN-Daily input files. An R script is provided to read the netCDF files and extract information on the goodness-of-fit of the modeled data to the observed station data. Script input: Required: the variable and year of interest must be specified in line 11 of the script. Optional: the specific station of interest may be provided in line 13. Example output plots and statistics data files are listed in the table below and are provided as companion files. These example files were generated from the netCDF file daymet_v3_stnsxval_tmax_2016.nc4. The station-level observed vs. predicted plot example is for station identification value USC00145363. The Daymet station-level cross validation data can provide insight into the regional accuracy of the Daymet model performance for the three station observation input parameters of maximum and minimum temperature and precipitation. Regression and mean absolute error over temporal and spatial patterns can be analyzed. Weather station contribution, distribution, density, and availability can be ascertained on a yearly basis. Overall, the Daymet data have broad applications over a wide variety of research fields including hydrology, terrestrial vegetation growth models, carbon cycle science, and regional to large scale climate change analysis. Measurements of near-surface meteorological conditions are made at many locations, but researchers are often faced with having to perform ecosystem process simulations in areas where no meteorological measurements have been taken. The continuous gridded surfaces of the Daymet data set were developed to overcome these limitations. Within the Daymet model algorithm, the Daymet cross-validation analyses were used to test the sensitivity of Daymet model methods to the variation of parameters and to estimate the prediction errors associated with the final selected parameters. The general cross-validation protocol is to withhold one observation at a time from a sample, generate a prediction error for the withheld case by comparison with observed values within the sample, and repeating over all observations in the sample to generate an average prediction error. The sample in this case was derived from the distribution of nearby stations based on the moving Gaussian distribution of stations for TMAX, TMIN, or PRCP on a given day. Interest is in both the absolute value and the sign of prediction errors generated in this manner. The surface weather observations provided here are the input used for processing "Daymet: Daily Surface Weather Data on a 1-km Grid for North America, Version 3" (Thornton et al., 2017), and were obtained from the NOAA National Centers for Environmental Information's Global Historical Climatology Network (GHCN)-Daily data set (Menne et al., 2012). The sparse network of Mexican stations available through the GHCN-Daily network was augmented with additional stations provided by the Servicio Meteorológico Nacional of Mexico for years 1980 - 2012. These data were obtained through an agreement with NOAA/GHCN-Daily in which GHCN-D acquired the station data directly from the Servicio Meteorológico Nacional and processed this data through the same QA/QC measures as all GHCN-D data is subject ensuring credibility to the data provenance of these additional data. The additional Mexican data were then provided to the NASA Daymet processing group. After year 2012, Mexican stations consist of those routinely available through GHCN-D data collections. Daymet for years 1980 - 2014 used GHCN-D data set version 3.22 downloaded on September 16, 2015. Daymet for year 2015 used GHCN-D data set version 3.22 downloaded on February 29, 2016. Daymet for year 2016 used GHCN-D data set version 3.22 downloaded on March 13, 2017. The set of ground surface observation stations that are input for the interpolation methods is collected from the heterogeneously spaced stations of the input data from three separate input files of minimum temperature, maximum temperature, and precipitation. The interpolation method at each prediction point is accomplished through an iterative estimation of local station density using the spatial convolution of a truncated Gaussian filter as further described in Thornton et al., (1997). In it, a system is established in which the search radius of stations is reduced in data-rich regions and increased in data-poor regions. This is accomplished by specifying an average number of observations to be included at each point. The search distance of stations is then varied as a smooth function of the local station density. The result is a seamless match of gridded daily data for adjacent tiles. In the Daymet algorithm, spatially and temporally explicit empirical analyses of the relationships of temperature and precipitation to elevation are performed. In addition, a daily precipitation occurrence algorithm is introduced, as a precursor to the prediction of daily precipitation amount. Daily predicted values for tmin, tmax, and prcp reported in this data set are generated by the Daymet model algorithm. The protocol is to withhold one daily station observation at a time from the sample, and generate a daily prediction for the withheld station. Where the sample is composed of observations from the model-specified number of neighboring stations (Thornton et al.1997). The ORNL DAAC will update the Daymet V3 products annually. Version and change history documentation are provided. Version 3.3 April 8, 2019 ORNL DAAC released Station-Level Inputs and Model Predicted Values for North America for year 2018. Version 3.2 July 6, 2018 ORNL DAAC released Station-Level Inputs and Model Predicted Values for North America for year 2017.